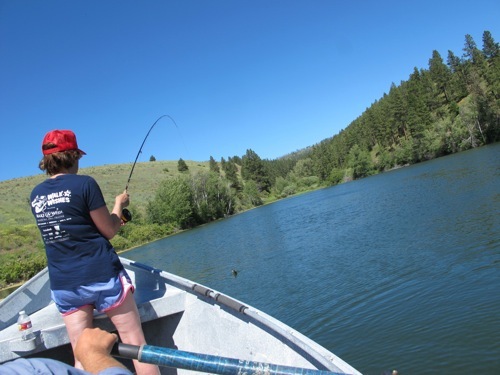 I recently had my first experience fly fishing in Missoula, Montana. And although I've had luck salmon fishing -- catching a 27-pounder at BC's Sonora Resort and a 40-pounder in Wrangell, Alaska -- I definitely need to work on my catch and release skills. It takes time, patience and lessons! If you're in Missoula, stop by Grizzly Hackle, and the fly shop will take care of you. My helpful guides, Bryce and Ben, were super patient with this novice! One of Canada's wilderness lodges that specializes in fly fishing was recently honored by the Orvis Company in its 2011 Endorsed Lodges, Outfitters and Guide Awards. Orvis, founded in 1856 and a company that pioneered the mail order industry, has a chain of 400 retail stores in the US and England and a network of more than 400 dealers worldwide. The seven categories of awards included three for lodge operations and four for guiding operations. They were based on customer service feedback received by Orvis from its customers who patronize the businesses. Expedition of the Year went to British Columbia's Fortress Lake Retreat. The full service lodge in Hamber Provincial Park provides accommodations for hikers, canoeists and kayakers -- plus guided fishing experiences. It's located in BC's back country near Alberta's Jasper and Banff National Parks and Lake Louise (where Prince William and Katherine recently spent their "free" night while on their Royal Tour). Fortress Lake was also named by Fly Fisherman magazine as the "world's best trophy brook trout destination." Taking a fly fishing lesson with Grizzly Hackle at Red Quill Ranch near Missoula, Montana. Photo by Sue Frause.